Dr Ali joined the Frenchs Forest Dental team in 2016. 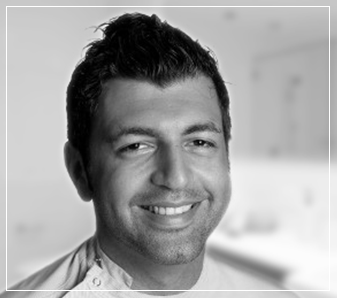 With 15+ years of clinical experience and having worked in dentistry across many parts of Australia, he has now settled permanently here in the beautiful northern beaches. to be gifted with good hand skills. Something his mother often reminds him, having spent many hours during childhood playing video games. For Dr Ali, the most rewarding part of dentistry is being able to work with his patients to help them accomplish their optimum oral health. He achieves this by providing sound education and utilising all modern aids now available in dentistry. His approach with patients is to discuss all the possible treatment options and help prioritise a treatment plan to reach their oral health goals. Dr Ali dedicated a large part of his career in training and developing expertise in several specialised areas of dentistry including dental implants, smile design and cosmetic dentistry. With that said, Dr. Ali believes that a healthy and holistic approach to oral health is essential towards the success of any given case. Cosmetic dentistry is a desirable by-product of an overall good oral health. Smile makeovers and aesthetic dentistry are increasingly a motivating factors for patients to seek dental treatment. At Frenchs Forest Dental we are dedicated to continuing education to stay at the forefront of the latest techniques and materials. Only the highest quality materials are used and all laboratory work is constructed by highly skilled locally trained technicians. Unbeknown to many patients, a large proportion of laboratory work is farmed off to China with unknown quality control and materials that are prohibited in Australia for dental use. Come and speak to us about improving your smile. We use an American implant system (3 i) which has 15 years of clinical data to back up its product with a 95% success rate. If the implant fails to integrate with the bone we replace it with no charge as long as you have been having regular 6 monthly check ups. Frenchs Forest Dentistry stands behind all its services. We use the best materials and the latest techniques. Both Dr Ali and Dr Ritchie regularly attend post graduate lectures. These lectures keep both dentists abreast of the new techniques that can be offered to their patients so that more than one option can be considered. Frenchs Forest Dentistry uses a local dental laboratory so that the quality and safety of the dental prosthesis is of the highest order. We do not send our work to China but to Killarney Heights so that any changes can be performed quickly with the technician either attending our surgery or one of our staff members taking you to the laboratory for a customised matching to your existing teeth. Frenchs Forest Dental is situated on the intersection of Blackbutts Rd. Glen Street and Lockwood Avenue. We are adjacent to the Glen St Theatre and Belrose Library Complex. Glenrose Village Shopping Centre is within easy walking distance. Parking is available on site with ramp access for the disabled. There is parking available on the street or in the reserve next to our clinic for those coming from outside the area, it is just a turn into Glen St. from Forest Way and follow to the end of Glen Street where our clinic is situated (google Map) or check the location on the web site. As a local surgery, Frenchs Forest Dental surgery offers a full range of dental services.